Brightwell Micro-Flow Imaging Microscope Particle Analysis DPA-4200 MFI . New Life Scientific, Inc. This Brightwell Technologies DPA-4200 is in excellent cosmetic condition. Unfortunately, New Life Scientific technicians were unable to test this product because the power supply is unavailable. The technicians connected the 1394-camera to a PC, installed the drivers, but the CCD requires power that cannot be supplied by the firewire cable. There is a stir controller and motor, but no flow cell, power supply, software, nor cabling will be provided. Brightwell Technologies was acquired by Cell Biosciences in May 2011, which was later renamed ProteinSimple in July 2011. 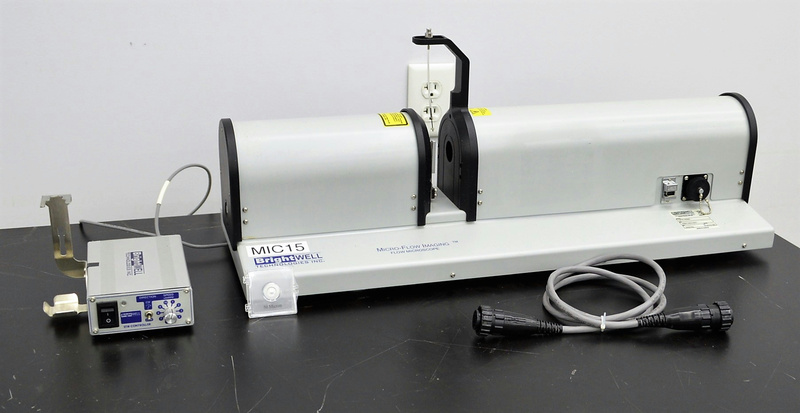 The micro-flow technology for sub-visible particle analysis implemented by this instrument is still used with ProteinSimples MFI, micro-flow imaging instrument line and supported with software, accessories, and consumables. Albeit the MFI systems differ cosmetically from the DPA-4200, the same micro-flow image methodology is implemented. NLS is not aware if ProteinSimple supports or provides service for the DPA-4200 and this product will be sold for parts. Please see the link provided and the table below for more details on MFI.